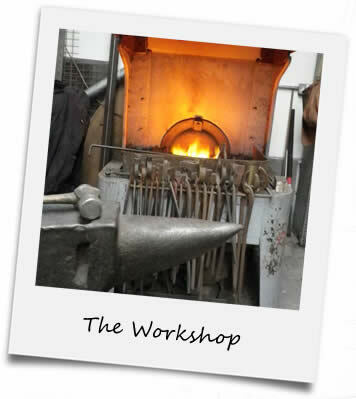 Sam Bailey, Artist Blacksmith is based in Bristol, North Somerset.From his forge Sam creates bespoke and imaginative items out of steel tailored to the clients specialist and individual needs. As an Artist Blacksmith, Sam Bailey incorporates the needs of form and function infto all metalwork he creates, as well as combining it with his unique creative style. Products range from artistic gates and railings to interior products such as beds, and sculpture. Sam uses a combination of traditional blacksmithing techniques such as forging and fire welding alongside more modern methods such as laser-cutting. With over 17 years of blacksmithing experience, Sam began working with metal in 1995 as an apprentice at a local forge. Sam then went on to study at UWE Bristol and then Brighton University, successfully completing an Art Foundation Diploma and a BA Hons in 3 Dimentional Design. Take a look at the gallery to see some images of Sam’s previous designs and projects. All pieces are designed and made to order. If you would like to make an enquiry or arrange a consultation don’t hesitate to get in touch via the contact page and Sam will respond ASAP.